Street racing is 2fast/2furious for most guys to get into, unless you want to disguise yourself as a race-starting girl -- a ruse that'll make the drivers furious and have you running fast. 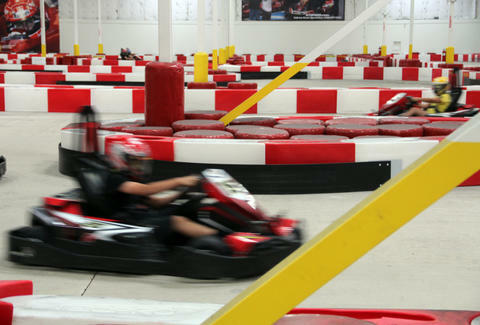 So, ditch the Diesel and go electric with K1 Speed, a 65000sqft racing zone where you'll compete with up to 11 other drivers Grand Prix-style in emission-free 20hp karts that can hit 40mph, so you're essentially starring in AISD School Zone Drift. Sign up for a racing license (good for 1yr), then get briefed on their colored-flag pit signal system and various rules (no bumping or things will get ugly), and you'll be all set to don a bright yellow head sock and helmet, then zip through their highly technical course during 14 lap sessions, which last about 8mins but'll have you so in the moment it'll feel as long as Fast Five. Once the dust settles you'll be given a printout of your results (also available online) that breaks down your performance by laptimes and position, and shows the current weekly leaders based on laptimes and a point system that qualifies you for seasonal competitive events against the best of the best -- if you're James Earl Jonesing for serious competition, you've found your new home. When your pedal isn't to the metal, get comfy in a leather-couched lobby decked out with flatscreens and actual Formula 1 cars, or hit up the gaming area for foosball and arcade racing, where you'll get 2furious over a red turtle shell.